Wow, 10 million hits! That's brilliant because that's 10 million thinking about kids and food. I am still working away quietly trying to raise money for Mary's Meals. Together we've raised £131,666.79 so far and I know the total is going to jump because last week I got told that Lidl are donating £7500 as part of the Young Fundraiser award and there's a big lump from my book! Keep an eye on the total to see how much it jumps! I have been asked to talk at lots of conferences. I find it hard. I always ask my dad to help. Last year I went to Copenhagen to talk at the MAD food conference. It was an amazing experience. It is organised by Renee from Noma and his friends. I learnt loads from the other speakers. Roy Choi spoke about feeding communities in America and I ate food cooked by ladies from a souk in Lebanon cooked by ladies with different religions. When it was my turn to speak every one cheered and my nerves got me. Martha Payne: "Changing the World, One School Dinner at a Time" from MAD on Vimeo. I was very glad my dad was there to help. Sorry Renee! 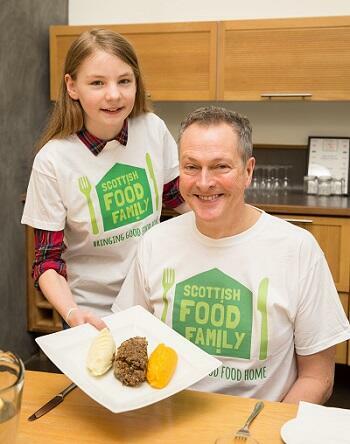 My whole family has also signed up to join the Scottish Food Family! It's brilliant. It's all about better food lessons in school, improving school meals and being really proud of Scottish food! There's also going to be a Scottish food day. I love growing food. I've got my very own sheep now and she is in lamb! We've loads to be proud of in Scotland. Scottish food isn't just haggis even if it is one of my favourites! You should make a haggis lasagne....it's awesome! It's great getting 10 million hits. Shows how important food for children is both in Scotland and around the world.